Coast Diamond is proud to announce Ford, Gittings & Kane Jewelers of Rome, Georgia as our featured retailer of the week. Ford, Gittings & Kane Jewelers have been fulfilling the needs of customers, in the heart of historic downtown Rome, since 1958. For generations this family business has built its success on customer satisfaction and a commitment to excellence. Joseph C. Gittings is one of the founding fathers of Ford, Gittings & Kane. Today, you might find him at his workbench where he enjoys mentoring those who have joined the company. His dedication to fine quality diamonds, gemstones, and superior craftsmanship laid the foundation for the success of Ford, Gittings & Kane. 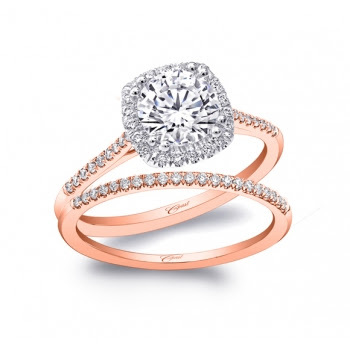 Ford, Gittings & Kane Jewelers invites you to come in to try on these trending Coast Diamond engagement rings and experience for yourself their tradition of quality, style and value. Ford, Gittings & Kane: Coast Diamond show-stopping halo engagement ring (LZ5015) with round diamonds on the shoulders. Pair either of these beautiful engagement rings with this precious and petite pave set diamond wedding band. It is available in rose, white, or yellow gold or platinum. Thank you Ford, Gittings & Kane Jewelers for your exceptional customer service and congratulations for being Coast Diamond’s featured retailer of the week. Loose Diamond and Bridal Jewelry Sale – September 25 and 26! Relax. We’ll Make You Happy. Over the last 50 plus years, Adolf Jewelers has focused on providing their customers with beauty, quality, elegance and great service in Richmond, Virginia. They are committed to complete customer satisfaction and they were recognized for their commitment when Virginia Living Magazine awarded them the 2015 Best Fine Jewelry Store in the Central Region of Virginia. So you can certainly Relax when buying your Coast Diamond engagement ring at the Coast Diamond Featured Retailer Adolf Jewelers, because they will make you happy. 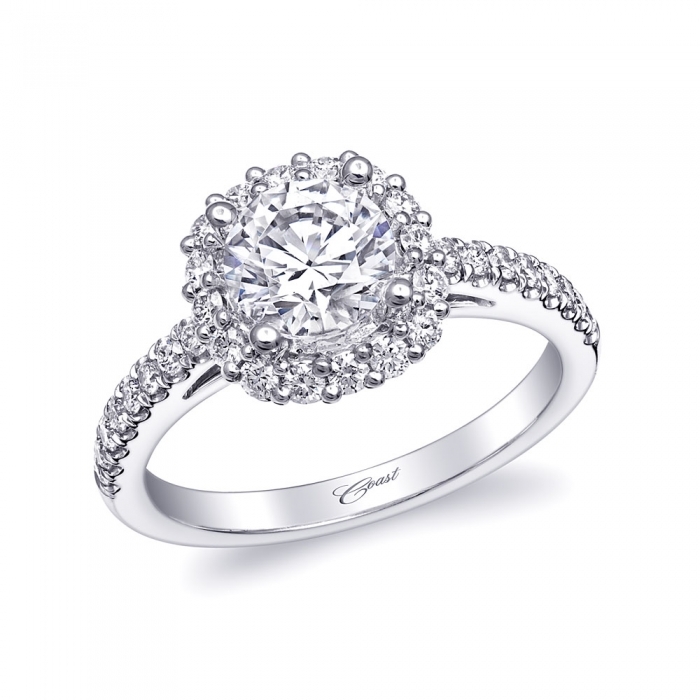 During your visit to Adolf Jewelers consider this trending cushion-shaped halo engagement ring from Coast Diamond. 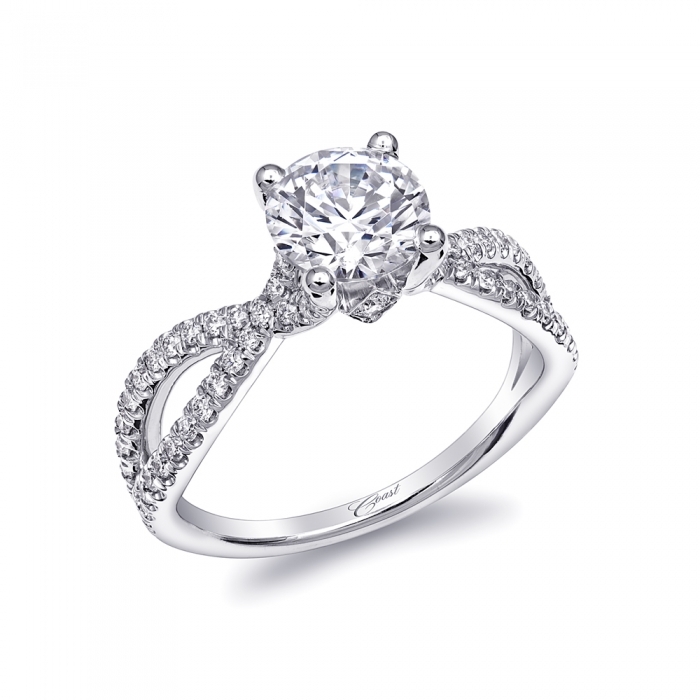 Adolf Jewelers: Coast Diamond radiant cushion-shaped engagement ring (LC5257) with diamond shoulders. Or this delicate, round halo engagement ring with diamond-encrusted shoulders. Adolf Jewelers: Coast Diamond delicate round halo engagement ring (LC5403). This 1 carat center stone Coast Diamond engagement ring is sure to stun your loved one. What better time than this football season to surprise your loved one with one of these beautiful Coast Diamond engagement rings from Adolf Jewelers of Richmond, Virginia? Congratulations Adolf Jewelers for being Coast Diamond’s Featured Retailer of the Week! Beyond Expectations. This is the promise of Cleveland’s finest jeweler and engagement ring store, Charles S. Rivchun & Sons. Fun fact about Rivchun’s founder, Charles S. Rivchun: Cleveland’s historical jewelry center was started by Charles in 1943, after he encouraged several fellow jewelers to relocate to what is now the City Club Building! Today the company is owned by longtime employees, Joe Soukenik Sr., Sharon Porrello, and Joe Soukenik Jr., who purchased Rivchun in 2001 and continue to carry on the family’s legacy nearly 100 years after Charles opened the original store in 1917. Service, quality and value are just as important to the staff in 2015 as they were to Charles back in the 1900s, and because of this dedication we are pleased to announce that Rivchun & Sons Jewelers is our Coast Diamond Featured Retailer. Brides in Cleveland adore this stunning Coast Diamond engagement ring, a top-seller at Rivchun & Sons. The unique criss-cross split shank of dazzling diamonds curves up to a 1.25 carat center diamond that is sold separately. (You’ll find a brilliant diamond with the help of the experts at Rivchun!) And don’t miss the pave diamonds on each side of the center diamond that give this ring a little extra bling. Two other trending engagement rings by Coast Diamond: an elegant cushion-shaped halo with a diamond encrusted shank, and another stunning one carat round diamond halo, pictured below. If you’re planning to get engaged during the holiday season, stop in at Rivchun & Sons this month to find the Coast Diamond engagement ring of your dreams. Congratulations to Joe Soukenik Sr., Sharon Porrello, and Joe Soukenik Jr., and the entire staff at Rivchun’s staff who carry on the legacy of superb customer service and offering the finest quality bridal jewelry and diamonds in Cleveland. Coast Diamond is honored to name this Cleveland landmark our Featured Retailer.